Liverpool’s Lantern Theatre lost its home to the developers in July but, undaunted, company director Margaret Connell has transferred to Grand Central Hall for this revival of Andrew Cullen’s 1997 black comedy, Scouse: A Comedy of Terrors. It’s a major shift from the tiny Lantern, offering full-scale staging and a cavernous space. Jocelyn Meall’s towering set provides a layered cityscape, fully utilising the new venues. 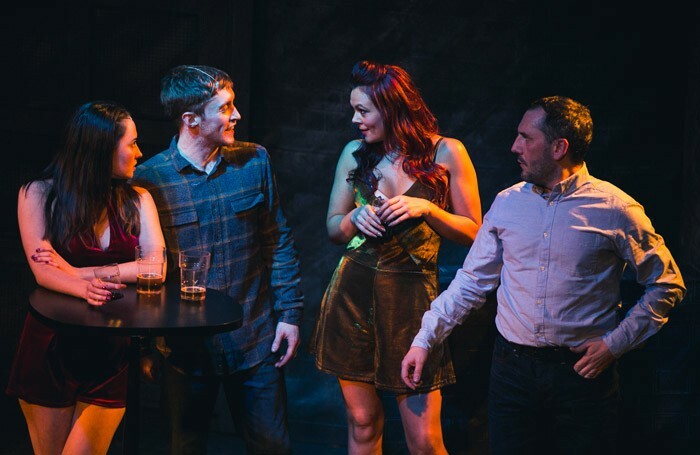 Post-Brexit, with the Liverpool region bucking the national trend with a remain vote, Connell felt that Cullen’s tale of a Republic of Liverpool has renewed relevance for the city. The play speaks loudly about divisions in society, in a community and within families themselves. Tour guide Tom and his wife Kath see their son and daughter heading for the hills as Tom and his friends Macka and Big Tom become involved in the Liverpool Independence Party. Amid the ensuing riots and police raids their relationship is stretched to breaking point. Jackie Jones and Peter Washington inhabit Kath and Tom with tremendous commitment in a pair of powerful performances, matched by that of Reg Edwards’ Macka. The energetic supporting cast also features James McMartin as Big Tom, who played Macka in the 1997 premiere. The first act develops slowly, much of the weight leaning toward comedy. But in the second act the real strength of the writing tells, as the wit becomes sharper and darker. Connell directs with an assured hand, racking up the pace gradually towards the tragic climax. This is a defiant cry for unity, and for the Lantern Company itself. Lantern Theatre reignites with a bold revival of Andrew Cullen’s defiant, dark comedy.